Is anyone else having problems with the sync in the TB10? I'm currently running TB10 on a Win7 desktop and, in the current and previous versions (10.0.13 & 10.0.11), the sync has been getting hung up and never resolves. The only way I can stop the sync process is to close the entire application -- and then, when I reopen the TheBrain, I have the option of resuming the sync where it left off, at which point, the sync starts running continuously all over again. A Help Desk ticket was created days ago, and output logs have been submitted -- so I'm mainly interested now in finding out if these problems with my installation are an outlier, or if there are others who have been dealing with this issue, as well. Any feedback and updates will be appreciated. I did have this issue in .11 (on my Mac), and mentioned it incidentally in another post here. The upgrade to .13 seems to have corrected. I've had issues on and off today - using Win 10 and version .13. I did have a successful sync within the last 30 minutes. This morning was the first time I opened 10.0.13.0 and I have experienced issues with syncing. I tried closing and reopening the app, but TheBrain continuously attempted to sync and never resolved. As I was writing this post, syncing behavior changed and began to fail immediately. I've started having problems this morning. TheBrain hangs and becomes non-responsive. I have had a successful sync (Mac) since I posted. We're happy to look at Output.log files if you'd like to send them into support@thebrain.com along with a description of what you are experiencing. Especially if you have an error message. I can tell you that we've been experiencing heavy traffic with the announcement of v10 beta. I too had a few "slow to respond/finish" syncs this morning, but when left alone, the sync should finish and not give errors. Syncs seem to be working great now. I'm still having NO success with syncing at all. In fact, the sync will run continuously for 24 hours if I leave it alone -- and I haven't been able to resolve a sync in days, so my web client brains are completely out of date. Several output logs have already provided -- and I'm receiving no error messages at all. The sync simply gets hung up at various (different) stages in the sync process, as detailed in the Help Desk ticket updates I've already submitted -- and the only way I can stop the sync is to completely close TB. A sync problem was found and fixed in 10.0.14. Please try this. Thank you, Harlan, very much for your help with finding a fix for this disconcerting issue. First attempt to download the 10.0.14 update failed, and the TB locked up completely. Had to shut it down manually using the Windows Task Manager. > The sync stalled and ran endlessly while "Preparing remote data...."
Third attempt: Closed and reopened TB, and this time I selected the option to start over the interrupted sync (instead of resuming where it left off), and this time the sync finally worked. Also successfully completed syncs on several other edited brains, and confirmed the recent edits in the web client. At this point, the sync function does seem to be functioning, although it also seems to be taking longer than usual, ever after several days worth of updates have been integrated. I don't know if this is significant (or indicative of a problem), or not -- so I will upload an output log on my help desk ticket, in case the engineers want to take a closer look. BUT the other brains still show "Preparing Remote Data"
how to select this option? Thank you for the feedback, Kiatic. I understand completely about the feeling of wondering if I'm the only one.....especially when no one else was reporting any sync issues. 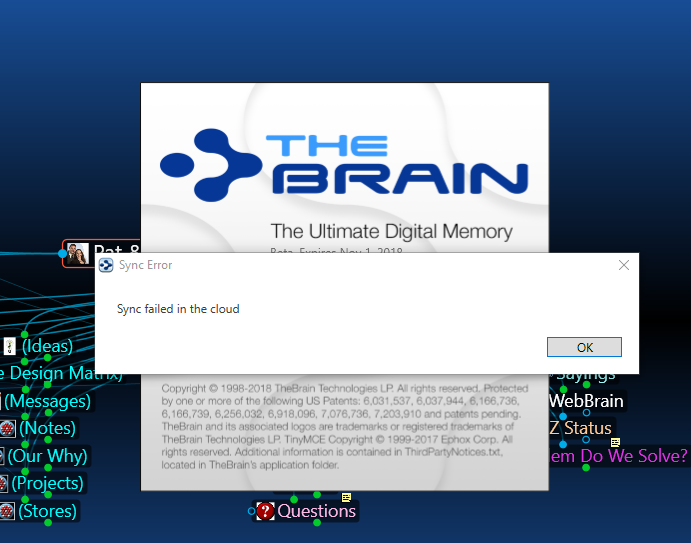 > Leave your current brains open (the ones that are displaying the sync error) and then CLOSE TheBrain application. > Select "Start Over" and see if the sync will resolve. In my case, "Resume" only perpetuated the problem I was previously having with the sync. In contrast, "Start Over" seemed to allow TB to get a fresh start (based on the new bug fix), and that allowed the sync to resolve as it should. Admittedly, it too a bit of time to sync since there were several days worth of updates, but it did eventually manage to finish. If this does NOT resolve the problem for you, please let us know .... and provide as much detail as you can about the steps you've taken. Alternatively, you can contact TB Support directly at the email address Matt provided above, and include screenshots and/or your current output log (available under the "Help" menu > Open Log Directory). This will allow Support to look for any specific problems that may be occurring in your TB10 installation. In order to get the option to restart, you will have to shutdown the app and reopen it. If an auto sync starts you will not get the option to restart. So you have to click and initiate a manual sync within 30 seconds of opening the app. The problem is a result of changes made to the sync process to support the brainbox. Unfortunately it does mean that you will experience more bugs than usual as we are rolling out new technologies and features that have a high degree of variability in the real world that we can’t simulate adequately in our internal testing.